The Wonders of the 115 made their one and only regular season trip to Sault Ste. Marie on Saturday night, capping a three-in-three against the perennial powerhouse Greyhounds. 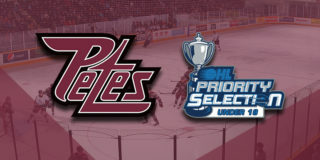 The Petes opened the scoring and made a late push, but ultimately had no gas in the tank and fell 8-2 (allowing four goals in the final two minutes of the game). Although Peterborough had the first powerplay opportunity of the night, it was the home squad who controlled the chances in the opening frame. 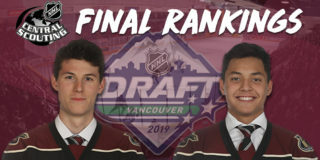 Hunter Jones and the Petes D-Men were repeatedly tested by the highly skilled Hounds, who created chance after chance with great cuts and passing. Jones was spot-on in the first, though, and the period ended in a 0-0 tie as the unfamiliar rivals underwent a feeling-out process. The ‘Hounds led the shot board 10-6 after one. Chris Paquette opened the scoring early in the second period, taking a breakaway stretch pass from Adam Timleck and roofing the puck over Matt Villalta in the Soo net. The home squad rebounded with confidence, though, netting three goals evenly spaced through the rest of the second period. 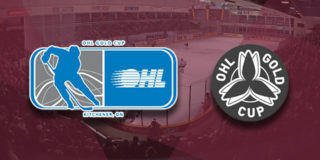 OHL leading scorer Morgan Frost scored his 100th OHL goal to tie the game from Keeghan Howdeshell, which was followed by a Jaden Peca shorthanded marker 10 minutes later. Finally, Mac Hollowell netted his league-leading 15th goal by a defenceman from Frost and Holden Wale to send the game to the intermission ahead 3-1. The shots on goal were 19-18 for the Hounds, despite the slightly more unbalanced goal differential. Peterborough got a second burst mid-way through the third as Max Grondin scored his third goal of the weekend (with Timleck adding his second assist of the game and fifth point in three games) to narrow the gap to 4-2. The score stayed close until the Petes pulled Jones for a last-gas effort, and that’s when things got weird. Sault Ste. Marie scored four goals in 90 seconds (Jacklin into an empty net, followed by markers from McLean, Kerins, and McLean) to seal the game 8-2 in what was one of the wildest examples of a team running out of gas late in the third game in three nights. The final shots on goal were 36-25 for the Greyhounds. Frost, Hollowell, and Peca were the first, second, and third stars of the game, respectively. 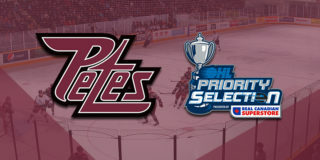 Single game tickets are on sale here for the Petes’ next home game on Wednesday, Jan. 30 against defending OHL Champion and East Division rival Hamilton Bulldogs.